Lespedeza thunbergii growing shrub‎ of the genus Lespedeza also known as Thunberg’s bushclover, Lespedeza thunbergii perennial deciduous used as ornamental nitrogen fixing hedge plant, can grow in temperate, mediterranean or subtropics climate and growing in hardiness zone 4-10. Flower color can be: purple, white, pink or more than one color, in pea shape flower. 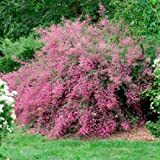 20+ Seeds of Lespedeza thunbergii - 'Gibraltar' Bush Clover. Elegantly cascading branches of profusely blooming majestic bush!